Chris Chambers wanted to prepare for a second career after football, and with the help of Andrew Hanley, he got his wish. Enter his Chamber! This place is just ridiculous. The Chamber facility is geared directly toward the client—no messing around. There is so much space inside and out. 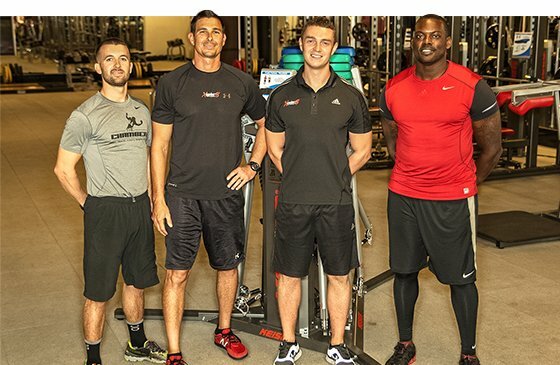 The trainers are a diverse group of athletes and professional instructors. Whatever you want, you can get it here. But don&apos;t go thinking this is a glamour house with windowed walls for your biceps curls. They will ask you to move, move, move. Your body is a result of your actions, and The Chamber forces greater action from you. If you want to be an athlete, learn to train like one. Name of Gym: The Chamber. Sports Training, Fitness & Therapy Facility. Hours of Operation: 5 a.m.-9 p.m.
We interviewed Andrew Hanley, The Chamber facilities coordinator and found out some remarkable things about this progressive gym. How did the gym start and why did you decide to enter the gym business? I have had a love for performance enhancement and the field of strength and conditioning for as long as I can remember. Growing up in Ireland, mentors, gurus, and inspirations were predominantly situated across the pond so it felt like a natural career progression for me to make the trip and explore the possibilities in the United States! 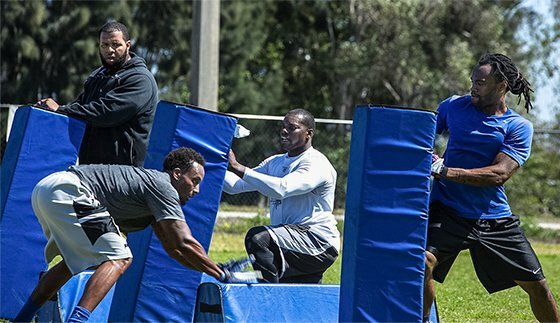 I was completing some off-season work with a group of NFL athletes a few seasons back, Chris Chambers being among them. When we got to talking one day during a training session in Los Angeles, he mentioned that he had eyes on developing his "second career" and expressed his love of the industry and desire to give back to the community. Here we are, 2 1/2 years later, soon to be celebrating a year serving the South Florida community. For a while we were South Florida&apos;s best kept secret, but now the word is out! A lot of blood, sweat, and tears. This project, from its inception, has been a labor of love, which continues to evolve. We set out with the goal of providing the community with an elite training facility, integrated performance training, nutrition, and physical therapy under one roof. The Xceler8 Performance training system utilized within our model requires space. We believe in building strength to support movement and in order to move, you require space. We looked tirelessly at numerous locations and chose our current location in Davie, because it checked all of our boxes. This process was without doubt the most difficult, yet fun, aspect of opening the Chamber. We already had a clear idea of the raw materials and tools required, so the build-out phase to grand opening ran as we had hoped. Athletes need to have bodies that can operate forcefully while in motion. The facilities at The Chamber enable athletes to train with dynamic force so they can take action. This is an area I could talk about at great length. It is not like any other facility you are ever likely to encounter. Every aspect of the facility was specifically designed and engineered to support our training systems and framework for success. No expense was spared to ensure The Chamber would provide the finest training experience and quality of service in South Florida. The training tools and equipment located throughout the facility are equal to that found in a professional weight room, exposing the members of The Chamber to the training world of the professional athlete. The Chamber is powered by Xceler8 Performance. These training systems and methodologies are ever-evolving and based on the best current evidence from peer reviewed research and professional reasoning. Our performance specialists have developed an understanding and appreciation of the unique training and competition demands faced by both athletes and non-athletes alike. We have created the perfect intersection between the science and practical application and our training results to date stand as a testament to that fact. We attract individuals looking for an elite training experience and a guaranteed return on investment in the form of progressive results. The Chamber attracts motivated athletes aged 8-18, as well as a large number of collegiate and pro athletes in virtually every sport. Non-athlete, health- and fitness-minded adults (doctors, lawyers, stay-at-home moms) are also drawn to us in both private and group settings by the nature of the facility and our training environment. The attraction is a world-class facility. The key to retention is our first-class training system and methodology. A desire to maximize their genetic potential, elevate their performance to a new level, to improve career longevity through reduced injury, a need to get active in a motivating environment, and last but certainly not least, a longing to look good in their birthday suit! At The Chamber, our clients&apos; goals become our collective goals; our athletes&apos; ambitions become our ambitions. They inspire us to bring our best everyday! Who are your top trainers and why are they so good? Modern day coaches are part coach, teacher, motivator, and role model. Coaches today have to be a lot of different things to a lot of different people and this has to be taken into consideration during the staff selection process. Our Chamber Performance Coaches arrived at this point from different paths and training backgrounds. Former personal trainers, CrossFit coaches, powerlifting coaches, and sport performance and speed coaches all come together under the Xceler8 performance training systems umbrella. Each coach brings their own unique skill set to the facility. Training styles are no longer looked upon individually, but collectively. We find the common denominators that connect the best components of all styles. As a result, our performance coaches continue to grow and develop on a daily basis. "Former athletes, personal trainers, CrossFit coaches, powerlifting coaches, sport performance and speed coaches all come together under the Xceler8 performance training systems umbrella." If you&apos;re not assessing, you&apos;re guessing. All members, depending on their training status and goals will encounter an evaluation of some description. Fundamental tests of strength, power, and motor performance will be used to assess the level of each individual client. The data will provide our team of performance coaches with initial baseline numbers. All information obtained will serve to drive our program design, from a corrective standpoint through to performance enhancement. Underlying health issues and imbalances will be addressed in conjunction with our medical partners to ensure we are priming our clients for optimum results and success. The Chamber houses a Hypoxico chamber, which simulates a high altitude training effect. Our members have the option to train in a reduced oxygen environment, where they can take advantage of the many physiological benefits, literally taking their training to new heights! Our outdoor movement and skills area adjacent to the facility is immensely significant toward the overall process and progress of our members. Our turf and track adds tremendous value to our service; it enables us to bridge the gap between weight room gains and on-field performance. To quote Will Ferrell from Step Brothers: "There&apos;s so much more room for activities!" (That&apos;s a Chamber favorite.) The space allows for a variety of sport specific movement skills and conditioning options, while soaking up the Florida sunrays. 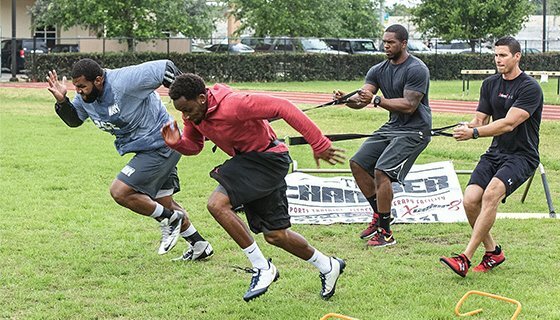 The weight room is vital to The Chamber, but so is the outdoor space, where football players and track athletes can train on familiar surfaces. Our nutrition and supplement cafe is a service that cannot be overlooked and should not be in any facility. Training is simply a game of stimulus and response. If a favorable response is the goal, assisting the body&apos;s adequate repair and recovery is a must. Recovery starts for our members before training begins. We like to jump-start the process before we begin to break them down in the form of pre-workout shakes and shooters. Post-workout supplementation is key. Let no workout be wasted. Wednesday is considered the regeneration and recovery day for members/athletes on our four-day per week training protocol. Massage and neuromuscular therapy services are available year-round for individuals looking to get a kick-start on their recovery process or simply relax and recuperate. The Chamber also boasts a professional Physical Therapy facility within the gym called Advanced Physical Therapy Network (APTN) that is available to members. Although it&apos;s a new facility soon to be celebrating only our first birthday, The Chamber has been privileged to have supported many top athletes and monsters of the business world in their career and lifestyle endeavors. We appreciate all of our clients. They help us keep the doors open, lights on, and staff on their feet. But if you insist we name drop, we could throw Wes Welker (Denver Broncos), Kevin Burnett (Oakland Raiders), Jhonny Peralta (Detroit Tigers) and Rafael Furcal (St.Louis Cardinals) in there to name a few. The Chamber is fast becoming a hub for numerous former greats and future hall of famers such as Jeff "Mr. Marlins" Conine and Cliff Floyd. What is the hardest part about operating your gym? As with any new business venture, teething problems will be experienced and are to be expected. Class scheduling proved to be the biggest contender for us in the early days, and we found ourselves often stretched when we went out of our way to accommodate every new potential member. As we gained a better understanding of our demographic and target audience, our road map began to take shape and things have operationally run a lot smoother since. Our key to successful facility operation is a systems-based approach: systems-based training, administration, and even systems-based cleaning. What makes you competitive over other gyms? We are guided by a strong set of core values and work effortlessly in the pursuit of greatness. Too many facilities demand it of their athletes and members, but not of themselves. Members within The Chamber experience a favorable athlete-to-coach ratio. We cap our group sizes to ensure attention to detail is met and quality of service is upheld. We invest time in our youth athletes. Our responsibility to these young athletes can&apos;t be taken lightly. We are in the business of building strong characters, forging positive thinking, creating respect and developing healthy lifestyle habits. Knowledge is power, so we strive to motivate through education. We spend time explaining the "why" instead of just teaching the "how." By providing context to exercise selection and sessions at large, we assist our members with goal setting by providing a realistic understanding of what we are trying to achieve with them and how we plan to get them there. Organization is key to any successful gym. The Chamber gives its clients space to complete specific protocols without feeling crowded. We adopt the same training systems and principles with our non-athletes as we do with the athletes. Too often the goal of one&apos;s training is to look good, whereas we believe that should be a natural byproduct of effective training protocol and nutritional education, rather than the absolute goal. Our members will learn to move and look good doing it. Our members train in a personable, motivating environment with peers of a similar mindset. For the sport enthusiasts, an opportunity to train alongside some of today&apos;s current professionals is an experience you will not get in too many facilities. Finally, the value is huge. Having unlimited access to South Florida&apos;s premier training facility, with unlimited access to knowledgeable staff, all for a reasonable monthly fee—it just makes sense! Does your gym support any special charities or community outreach organizations? Yes, Chris created his foundation C.A.T.C.H. 84 (Children Achieving Through Community Help) in 2005, operating exclusively for charitable and educational purposes. The Chamber is directly affiliated with C.A.T.C.H. 84, providing educational seminars, skill camps, and numerous facility scholarships for underprivileged children in both Ohio and South Florida. 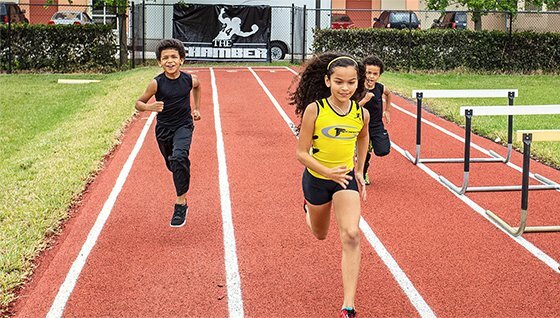 Community outreach enables gyms like The Chamber to affect the lives of children who otherwise may not learn the benefits athletics and fitness provide. Has Chambers still got the wheels or has he lost a step? The big guy still has it! He turned a few heads running with the best during our NFL Combine preparations. The real test will come when we stage the Chamber staff Olympics. Nowhere to hide. How did your NFL Combine group fare? Very well! This was actually our second year supporting athletes during their NFL Combine and Pro Day preparations, and the first in our current facility. Of this year&apos;s class, we currently have six entering training camp with their respective teams. The Chamber is pleased to see their efforts rewarded and we look forward to assisting them throughout their careers.